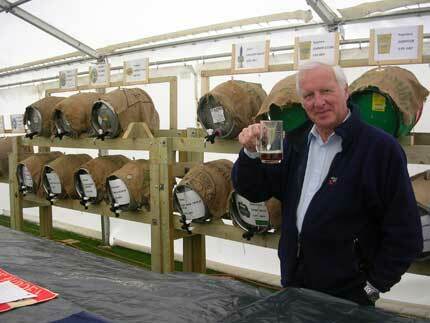 We’re into the home straight – only 9 days until the opening evening of the Langford Beer Festival 2012! To quench your beery (or cidery or winey if you so desire) thirst whilst you wait for those gates to open, here’s what we have been up to. 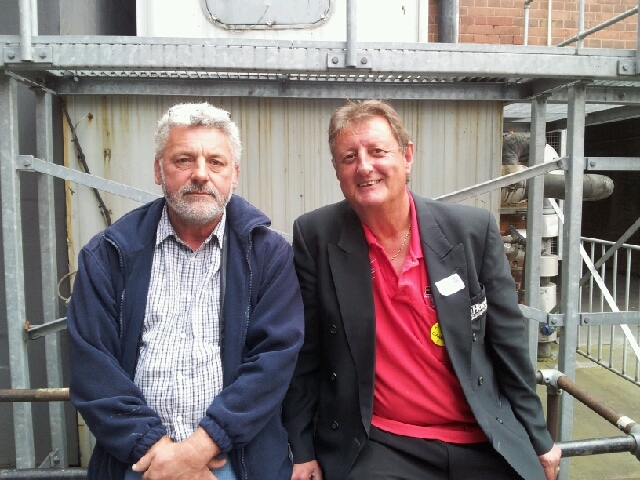 Pete takes his role very seriously, not even raising a smile for former five time world darts champion – Eric Bristow! It has been a busy couple of weeks at Beer Fest HQ. The build up is an exciting part of the Beer Fest process, but also a pretty stressful one as there are some key decisions to be made – not least the decision of which of this nation’s fine real ales will be racked next week. It may seem an easy task, but it is one that chief beer selector Pete Dennis takes extremely seriously (demonstrated by his expression in the photograph). Whitling the thousands down to just 32 isn’t easy…but we’re nearly there – watch this space. Don’t forget there will be 10 ciders on offer at this year’s festival, as well as a fine selection of wines. We’ve teamed up with our good friends over at the Wyndham Arms in Salisbury to organise return travel by coach on the Saturday evening of the Beer Festival. For £17.00 you get return travel from the Wyndham (see location here), and entry into the Beer Festival. You can book your ticket online here. Why not get to the Wyndham in time to enjoy one of their fine Hopback beers to get you in the mood for the evening? We’re delighted to say that camping is available this year. It costs just £2 per person per night. Picture the scene – waking up next to a lake in the scenic Wylye Valley after attending the Beer Festival the night before. Simply add camping to your order when booking online. We’ve all been to a beer festival where you’re looking forward to one beer in particular, you get to the bar and hand over your glass only to discover that you have missed your chance and the beer is gone. You don’t know what to do – suddenly you have to think of an alternative but your heart was settled on that beer! You want to consult the tasting notes but eager beer drinkers are breathing down your neck wishing you would make your choice and let them get to the bar…..Fear not at this year’s Langford Beer Festival – thanks to some nifty technology found by Ryan in Bristol, the levels of all the beers will be projected on to the roof of the beer tent. This will ensure that you don’t miss your favourite tipple and can rest assured that chief bartender Terry (pictured) won’t be putting undue pressure on you to make a poor decision. That’s all for now. If you have any questions then please don’t hesitate to get in touch at info@langfordbeerfestival.org.uk. Don’t forget you can also follow us on Twitter (@LangfordBeerex) and keep up to date on our Facebook page. Told you, high-tech ;-). This entry was posted in News and tagged Beer, camping, hopback, salisbury by edwyre. Bookmark the permalink.